Equities are also known as stock. This is where shares like GENTING, PBBANK, PROTON and the others are listed and traded every day. Things get more interesting in this class because #1 Highest amount of funds in this class #2 Highest amount of “ka-ching” on board and #3 Spoilt by choice with mind boggling categories. However the truth is, there are only several categories that are worth to invest as highlighted by green rows in the below diagram which shows you the total returns % up the last five. Step 1: Expectations. Decide your risk profile. I will pick 10% returns p.a. hence the following will be used for screening: 1-year returns 10%, 3-year returns 33% and 5-year returns 61%. Step 2: Screening. Fund screening can be done via web @ lipperleaders.com. If you observe carefully I also added two additional funds which do not have a Lipper Rating of 5. This is because for their classification there are not enough funds to classify them. You ought to eyeball the hardcopy table from The Edge magazine or Personal Money to find them and add in the list for analysis. They are Hong Leong Consumer and Hwang Asia Quantum. Seek exposure on Equity Malaysia Sm&Mid Cap, choose Public Focus Select half the size of Public Small Cap and has better preservation record so you don’t get a heart attack. Insurance investment-linked plans you can go with AIA, Allianz and Etiqa choices below. 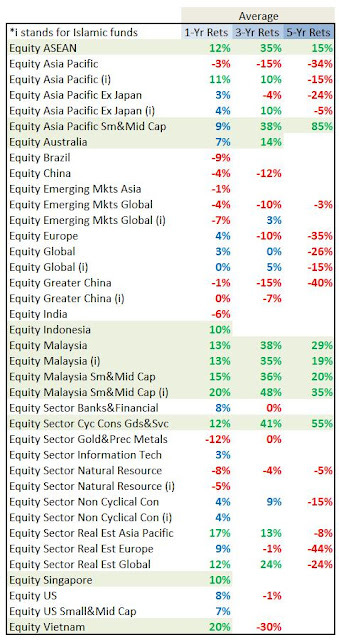 *Expected returns: 1-year returns 10%, 3-year returns 33% and 5-year returns 61% (this alone killed half the list). Step 4: Fund Size. Usually bigger funds do not outperform smaller ones but anything less than RM 1 billion for an equity fund is fine so we have nothing to wipe out from the list. Need prove? 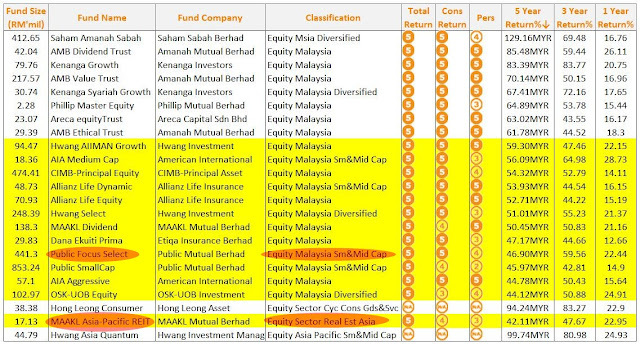 The table below shows the biggest elephant size equity funds in Malaysia. Not that I am against Public but the underlying problem facing them is that they are too popular, this is why they are big. Imagine that you have RM1 billion to manage, you CANNOT simply dump them into 30 different stocks as they will be too overvalued. So the only logical choice you have is to spread it out vastly on over 300 companies in the main board which make it look like a stock market itself - and probably end up spreading the fund manager's attention too thin. REMEMBER THIS: Never ever will any bigger fund outperform a smaller fund. But not all smaller funds can do better than bigger funds. Confused haha? Step 5: Preservation. There’s one that really stands out, we’ll remove Philip Master Equity. Second point: by looking at the 3 Year returns only three funds made it above 80% as well as providing >20% returns for a year period as well. Third point: All three are in different classifications so that’s a good point for diversification as you don’t want to put all your eggs into a punitive country like Malaysia that looks like a dot on the world map. So I shall short the list. Now you clearly see that these funds are not BIG in size and they perform superbly well with consistent results among each other. 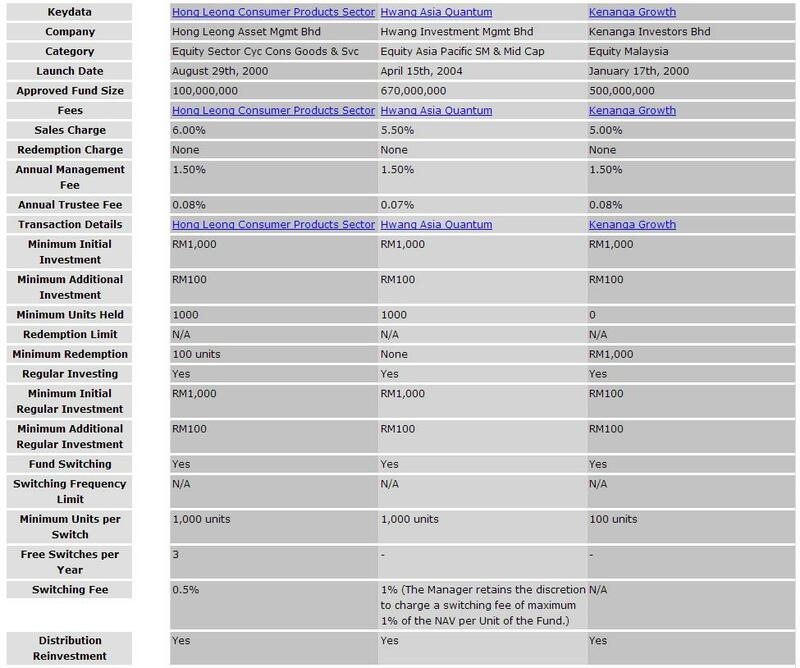 Go with HL Consumer Products with a track record of *17.38% returns p.a.!! Go with Hwang Asia Quantum with a track record of *18.50% returns p.a.!! Go with Kenanga Growth with a track record of *15.10% returns p.a.!! *Minus annual management fee not considering one time sales charge, returns p.a. based on 5 year performance. Remember from my previous post in Part 1. "At 15% returns p.a., RM5, 000 will grow to RM330, 000 in 30 years! But with 5% (EPF) p.a. you will only obtain RM21, 600. Stretch it to 10% it grows to RM87, 000! Let’s don’t argue at this page whether 15%-10% is achievable or reasonable, I will leave it for future postings." May I know if all these funds only available for EPF member investment scheme? I do not have EPF, can i buy all these funds? No, you can also invest them under your own 'individual capacity'. Just speak to an agent or the bank's representative. Thanks, learn a lot from your blog as newbie in investment. Planning to buy MAAKL-HW Flexi Fund.